A year down the line, they’ve made a few small changes and one big one. The small changes include ditching that awful food-matching copy on the box and throwing in a couple of nice extras – a small packet of something crunchy and a large, almost newspaper format magazine, Ferment. The basic setup remains unchanged: you still pay £24 a month for eight bottles of beer delivered to your door (although the price drops if you take out a longer subscription). Unimaginative tightfist that I am, last time round I got a bit stuck on that figure of £3 per bottle – particularly as several of the bottles were 330 or 355 ml – and a rather predictable internal argument ensued: “You might have to pay that much in a specialist beer shop!” At that price I just wouldn’t buy it. “If you think of it as mail order and allow a bit for P+P…” Yeah, but I don’t buy beer on mail order. And so on. All 330 ml bottles except the Lucky Jack and Vocation, which were 330 ml cans – rather nasty contract-labelled cans in the case of the Vocation. I think you’ll agree there are some names to conjure with there. The Dark Sister was a black IPA; apart from that everything that doesn’t have a style in the name was a pale beer. And most of them, I’ve got to say, were really good. Hand on heart I didn’t much enjoy the Cloudwater, but I’ve never had a grisette before – supposedly it’s like a session saison – and I’m quite prepared to believe it was true to type. I did enjoy the Belgian IPA – which did what it said on the label – and, slightly to my surprise, the mead: it had a strong taste of honey without being at all cloying. I left the canned beers till last to see if I’d detect any oxidation from the excessive headspace which is a risk in canning (particularly contract canning), but I’m happy to say I didn’t – I’ve been highly impressed by Vocation beers on cask, and this one was almost as good. I don’t do advertising, but I do think this is a good range. (Oh, very smart, going for the we-all-hate-advertising dollar… Shut up, inner Bill Hicks!) Bear in mind that the actual beers I got were last month’s selection or possibly the month before’s – you’re not going to get these beers if you sign up today. But if that list is at all representative of the kind of breweries they’re dealing with, I think it shows that what Beer52 are offering has improved a lot. As for whether it’s worth £3 a bottle, or £24 a month, for me I think the answer is still probably not, but it’s a close thing. Besides, I’m writing as somebody who lives within fifteen minutes’ walk of three different off-licences that sell Cloudwater beers (among much else). If you’re less fortunate in that respect, there are certainly worse things that you could do with £24 a month. So, this Brewhive business – what’s it all about? As I mentioned in an earlier post, I put some questions to the company’s friendly intern in an email. Three days later – considerably longer than it took to deliver the beer – I got a reply from Andrew Veitch, one of the company’s founders. Here are my questions again, with Veitch’s answers inserted. 1. Who is/are the brewer(s)? What is their background (other breweries/Heriot Watt/home brewing etc)? 2. Where does the brewing happen? Does Brewhive have its own brewkit, or are they going down the ‘gypsy’ route (brewing on other brewers’ kit), or contracting the brewing out? What’s the brew length for each of the main styles? Where is the cider made? We did the initial test brewing at Drygate (although it wasn’t the Drygate team) and the brewing is presently at Clonmel in the small batch brewery on the Bulmer’s site. That brewery is 100k hectolitres. 3. The choice of styles is interesting – it seems quite conservative when compared with the more exotic and innovative styles that a lot of startup breweries are coming out with. How were these three beer styles (and one cider) arrived at? Will Brewhive be expanding this range or offering short-run specials? We’ve done a lot of customer research and our customers are looking for beers that are more interesting than commercial lager but are lower ABV and less strongly hopped than most craft beers. This fits in with our focus on food matching. A conservative range is actually exactly what we are aiming for so I’m pleased you used that term. We will develop the range further and may use other brewers for guest beers or special editions. 4. Why ‘craft’? What does ‘craft’ mean to you – and if someone asked you to justify calling Brewhive a craft operation, how would you go about it? Our objective was to create some beers that are aimed at people who are presently drinking wine or drinking commercial lagers. We are absolutely not aiming at people who are presently drinking craft beers (and in fact we do try to avoid the term “craft beer” to describe our beers). 5. The pitch to the online retail space is very strong; from a customer’s point of view, you seem to have a lot of the bugs ironed out (lack of availability, high delivery charges etc). Will Brewhive always be an online retailer of bottled beer? Can we expect to see the Brewhive logo appearing in shops or on bar taps? Our plan is to be online only although we may be available in certain restaurants. However we will never be available in supermarkets or bars. Veitch has a few key points here, which he’s been putting across quite consistently (see his answers to the questions posed by the Look at Brew blog). Firstly, the people running the company aren’t doing the brewing. The Bulmer’s site at Clonmel in the Republic of Ireland (now owned by Guinness) is actually where Magner’s comes from – nothing to do with our own dear H.P. Bulmer’s (now owned by S&N). Secondly, these beers aren’t aimed at people who know about beer, and they’re meant to be bland: “more interesting than commercial lager” but not high in alcohol and not strongly hopped. (Veitch may need to have a word with Kevin Dorren, who told the world back in January that “Brewhive is unique due to it’s [sic] focus on the hop. Most beers don’t make a big deal about the hop, but we plan to!”) Thirdly, it’s not craft beer. There are some mixed messages here – googling for “brewhive” and “craft” brings back more than twice the number of hits as if you search for “brewhive” without the word “craft”. There’s also that line on the Liquid e-commerce site, quoted earlier, to the effect that Brewhive “plans to have the largest range of craft beers in the UK” – not to mention Kevin Dorren‘s description of Brewhive as aiming to be “the largest craft beer brand in the UK”. But let’s write that off as marketing flannel and take it that Veitch is speaking for the company: craft beer is (mostly) strong and hoppy, and that’s not what they’re doing. Kevin has started or been employee No 2 in a number of startup companies in the UK and USA in a number of fields, including Technology, FMCG and advisory. Between 1997 and 2001 he was CEO of Orbital Software – a person to person knowledge management company founded from Heriot Watt University. In 2008 he cofounded Diet Chef with Andrew Veitch. Andrew founded Diet Chef with Kevin Dorren and also has been the founder of Fine Coffee Club a leading Nespresso compatible capsule competitor. He has extensive experience in direct to consumer marketing and has coding experience with Python, Django and other web technologies. Which, in an odd sort of way, answers all my questions. Why aren’t they brewing their own beer? Because they’re not brewers. Why are they selling their own brand of beer instead of retailing other people’s? Because they’re running an online beer retailing business on the same lines as their earlier diet and coffee retailing businesses; being an intermediary for back-end suppliers would introduce complexity and cut their margins. Why are they having the beer made bland? Because they want to make the target market as big as possible, and they judge that strong flavours will repel more people than bland ones; because they’re not brewers and don’t have any personal investment in the flavour of the beer; and for simplicity and better margins. Beer lover & trainee sommelier. “Apparently there is a Brewhive sommelier,” says Brew Geekery. That’s not quite how I’m reading it. The latest thing they’re moving on to is beer, where they’re looking to get in at the mass-market end of the spectrum – not the ‘BrewDog in Sainsbury’s’ mass-market, the real mass market, the one where people don’t want to sandblast their tastebuds but just want to feel like they’re drinking something a bit… different. Given their (lack of) background, it’s not too surprising to find that they’ve got the online user experience and the fulfilment side pretty much right, but that they can’t really talk the talk when it comes to beer. And then there’s an even bigger problem, which is that they have a much stronger idea of what the beer shouldn’t be (strong, hoppy, challenging) than what it should be – and the actual brewing is being done by a big corporate brewer, to (presumably) a tight budget. So we end up with a total mismatch: it’s the kind of bland, mediocre beer that you can sell by the gallon through a keg font with a magnet on the front, but they’re trying to sell it in 33 cl bottles (a classic symbol of ‘craft’), in an online marketplace where the level of customer knowledge is pretty high and the demand for innovation is even higher. It’s interesting that they’re planning to stay online-only, except perhaps for “certain restaurants” – presumably restaurants where they can get exclusivity; it sounds like a strategy for avoiding direct comparisons, and makes me wonder if they’re conscious that the beer isn’t all that good. The trouble is, you don’t need a blind tasting of their IPA and Punk IPA (or even Greene King IPA) to know how poor their IPA is – anyone who knows anything about beer will tell straight away. Is the idea to make it work by somehow angling their marketing at all those people who don’t know anything about beer? But if that’s the case, why would they be trying to market it through bloggers and beer cognoscenti like what I am? Since I started this series of posts another couple of reviews have appeared, and I’ve had to consider an unwelcome possibility: what if they don’t care about quality? To put it another way, what if they’re aiming at a market consisting of people who don’t care about quality – wouldn’t that make it completely pointless to criticise the beer in terms of quality? And what if a bit of ‘ordeal by social media’ were just part of the process of getting the name out there and building brand recognition? Even if everyone’s more or less critical about the beer, every review that appears online is another search engine hit for “Brewhive” – and every review can be quoted selectively. Maybe I’m being played, to put it bluntly. I like that the company are aiming towards the ‘entry level’ end of the market, and once those recipes are re-worked they could well prove to be a good bridge from mass produced to artisan. But better bridges exist already. It’s not as if you needed to book an appointment at Beer Ritz in order to find anything better than “commercial lager”; just look in the beer aisle of your nearest supermarket, or stick your head in one of those temples of geeky beer elitism called J. D. Wetherspoons. And it’s not as if Brewhive were offering to educate the ‘entry level’ crowd as a public service. It’s a bit like saying that a sausage with most of the meat replaced by rusk and fat would make a good gateway food to encourage non-sausage-eaters to explore the good stuff, and then starting a business selling a new brand of low meat-content sausages. You’d make some money, but you wouldn’t actually be doing anyone a favour, including your non-sausage-eating target market. Basically, there’s nothing Brewhive are doing that needed to be done. These people have no brewing background and know next to nothing about beer; they’re only in it to make money out of customers who don’t even like beer. I recommend giving the beer a wide berth (never mind the cider), and I hope the people behind the company have a serious rethink – preferably to the point of quietly giving up the whole idea. Gary: So tell me more. Gary: Crowning Glory. Is it nutty? Is it foamy? Is it hoppy? Does it have a surprisingly fruity note which lingers on the tongue? Gary: We’ll have five of those, please. I wrote back to Brewhive, saying I’d like to try their beers, on a Wednesday night; the beer arrived on the Friday morning. This was impressive. I’d expressed interest in the cider as well as the beers. The box – apparently a feat of cardboard engineering designed to minimise breakages – contained six bottles, a bottle opener and a delivery note listing two bottles each of the beers plus one of the cider. This would have been an enterprising use of a six-bottle crate; in fact there was one each of the cider and the lager, and two of the others. Here, without any editorialising, is the label copy. And we might as well do the full set. TASTING NOTES: A refreshing, fruity cider with crisp apple top notes and a clean finish. It’s hard to know where to start. I’ll deal with the cider label first, because it’s particularly awful – a ‘fruity’ cider with ‘apple top notes’? A cider that’s been ‘carefully brewed’ (you don’t brew cider) from ‘a variety of succulent apples’? ‘Well balanced sweetness with a hint of dryness’? This isn’t quite at the level where you genuinely suspect it’s been written by a bot, but it’s alarmingly close. It conveys no information at all, while running up all the ‘style’ flags it can find. It reads as if it’s been written by somebody who’s read a food magazine from cover to cover and then, well, looked at a bottle of cider. As for the beers – are they nutty? are they hoppy? do they have a surprisingly fruity note which lingers on the tongue? No, but they have ‘notes’ – grapefruit and lime, vanilla and caramel, citrus and spice; one of them has ‘hints’ (grapefruit, lime and caramel), one has an ‘undercurrent’ (hop-infused flavour) and a distinctive grainy ‘bite’, while the third rather disappointingly has a liquorice ‘taste’. It all seems nice and foodie (drinkie? ), it’s just that the words are wrong. Caramel notes come from the malt and are generally avoided, or even looked down on, in the hop-chasing fraternity; it’s very odd to boast about the caramel, never mind putting it in with the hop fruit salad. As for the porter, it’s brewed with Summit, a hop noted for “pungent, spicy citrus flavors bordering on the savory”; anything less likely to give ‘notes of vanilla & caramel’ is hard to imagine. (Unless they meant salted caramel?) A ‘hop-infused flavour’ basically means nothing, as does ‘bold yet mild’; ‘bittering’ refers to how you use the hops, not what they taste like; ‘hops infuse with chocolate malt’ isn’t even grammatical. The lager is described as bitter, ‘malty sweet’, citrussy, spicy, grainy and clean-tasting, which would be quite a trick. And so on. Like the dialogue from World’s End I quoted at the top, these labels seem to have been written by someone who knows what beer-speak sounds like but doesn’t actually know beer. I’ll start with this one because I don’t want to be relentlessly negative, and this was reasonably nice. I drank it after getting back from Germany, and even then I didn’t think the ‘German lager’ designation was miles out – it had a dry, flinty quality which reminded me quite pleasantly of a half-decent mass-produced pilsner. There was a bit of a fresh, citrussy front-of-mouth attack going on as well, which got more obtrusive as you got through the bottle, and which I thought didn’t really belong – it was more like a taste you’d get in an old-school bitter than a lager. Still, it went down very easily. Don’t get me wrong, half-decent mass-produced pilsners which are actually from Germany and the Czech Republic are widely available, and there’s no way I’d advise anyone to take this over the real thing – a PU or even a Bitburger would knock spots off this. But if it was this or a supermarket own-brand bottled lager – a St Cervois, say, or a Bière des Moulins – the Blonde Brew would win every time. But I’m afraid that’s about as good as it’s going to get. This was a bland, sweet porter with a definite chocolate flavour and very little bitterness, ‘strong roasted’ or otherwise. In fact it was fairly light-bodied and thin-tasting. This wasn’t just because of its low strength; there was also a distinct (and familiar) citrussy lightness of flavour in the front of the mouth. By the bottom of the glass it almost felt as if I’d been drinking two different beers – a dark mild and a bog-standard brown bitter, possibly on keg. Certainly not as bad as the Pale Brew, but it did show a definite family likeness, and not in a good way. For completeness’ sake I had a taste of this, but gave the bottle to the family’s resident cider fan. For what it’s worth, it was the most heavily carbonated thing I’ve poured in a long time: by the time I’d carried the glass from one room to another the back of my hand was soaking wet. Impressions? If the Pale Brew took me back to the late 1970s, this took me back even further – to Woodpecker cider, which I thought was very adult and sophisticated when I was twelve. (I remember feeling I’d really grown up when I graduated to Strongbow.) ‘Well balanced sweetness with a hint of dryness’ is about right: I got sweetness balanced with more sweetness, followed by… nothing: where most ciders have a finish, an aftertaste or both, this one just sort of stopped. I hate to bite the hand that feeds and so on, but I’m a reviewer, not an copywriter. I like the idea of making a business out of selling a limited range of beers online and doing it well – and the Web site is pretty nice. But the beers (and the cider) were just not very good: on a scale of 1 to 10 I’d give the lager 4, the porter 3 and the other two 1. So what’s going on here? How does somebody put so much work in to get all the elements right – the ordering, the fulfilment chain, the packaging, the Web site, the blog, the pitch to leading social media opinion-formers (hem hem) – and get the actual beer so wrong? More about this in the next post, and a bit more about Brewhive the company. Like other beer bloggers, I’m occasionally approached by brewers and distributors offering freebies of various kinds. (Needless to say, I’m approached rather more often by brewers, distributors and various other people not offering freebies, but most of those approaches can be ignored.) I treat this stuff as fuel for the blog: my main criterion for accepting a freebie is whether I think it’ll make something good to write about. Just the other day I turned down the offer of a three-course meal from a restaurant whose PR clearly had me listed under “food and drink”; I asked if there was a beer angle of any sort, it turned out that there wasn’t, and that was that. So I was intrigued when I received an email, just under a month ago, from… well, I’ll take the liberty of quoting the email. My name is [redacted], beer lover and Summer intern for a new start-up beer company Brewhive. As part of my research into the industry I’ve been looking through your blog and have really enjoyed it. You really seem to know what you’re talking about and have introduced me to the whole concept of ‘real ale’ which previous to this job I wasn’t aware of. 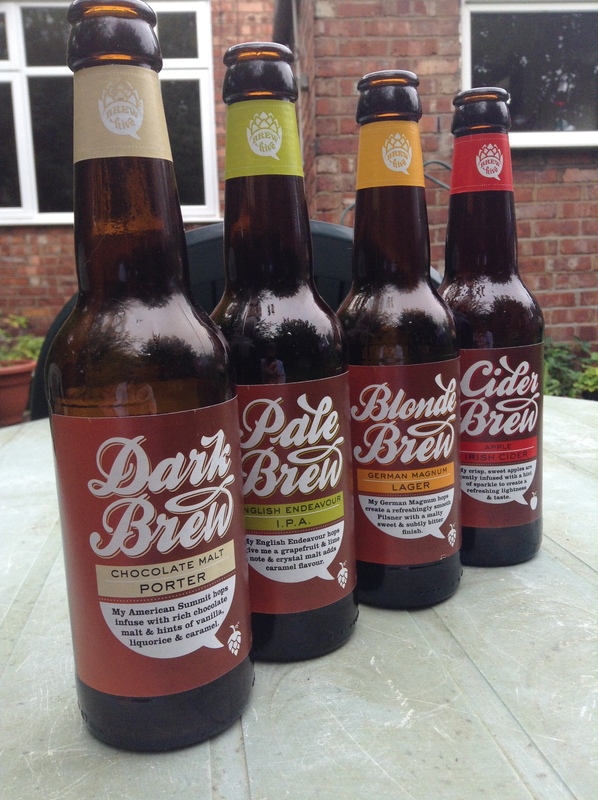 Here at Brewhive we’re trying to enter the world of craft beer through the online market. We’ve developed a small line of 3 core beers that we hope gives our drinkers a rounded example of the beers out there for them: a pilsner made with the German magnum hop, an English endeavour IPA and an English chocolate malt porter. I would be really keen to send you a sample of our beers so that you could try them and provide us with some honest feedback either personally or on your blog. Please let me know if this would be interest to you. I was a bit surprised that this ‘beer lover’ hadn’t come across the concept of ‘real ale’ before reading my blog, but let it pass. (It’s a touch of personalisation, if nothing else – and ‘real ale’ is indeed one of the main topics I bang on about here.) I was intrigued by the idea of an online retailer entering the market with a dedicated range of beers – an online brewer, in effect – and the beer sounded as if it might be interesting. So I did a bit of basic research online. The first thing that struck me about Brewhive was that they were taking social media seriously: the first page of search results brings back Brewhive material on Twitter, Pinterest and Instagram, as well as Facebook, Untappd and the company’s own Web site. I imagine a lot of this is down to the summer intern (job advert). The company site – here – is fairly basic but well-designed and clean-looking. It’s mainly given over to describing their products and selling them online, as you might imagine, but it also includes a blog written by Anna Roper. She describes herself as “the resident beer expert here at Brewhive” and promises to keep us updated on her journey to becoming an accredited Beer Sommelier. On the ordering page there’s a rather nifty ready-reckoner that enables you to price up a selection of beers (and cider), to be delivered in multiples of six bottles from the company’s warehouse in Edinburgh. The first time I saw this page it offered something that really got my attention – free delivery for orders of twelve bottles or more. Pricing up an online order and then mentally adding a fraction of the delivery charge to the price of each bottle has always been something that annoys me about online ordering; a retailer who was willing to absorb the delivery costs on larger orders would have a real edge, I thought. Apparently Brewhive didn’t think so – or, more probably, they decided that their business model wouldn’t support it – as this is no longer being offered. The beer is priced at between £1.85 and £2.20 per bottle, for 330 ml bottles – not expensive per bottle, but not dirt cheap per litre by any means (it’s the equivalent of a price range of £2.75 – £3.30 for a 500 ml bottle). And the beer isn’t particularly strong; the cider is 5%, but all the beers are either 4% or 4.1%. Brewhive is an emerging brand within the growing craft beer category. Designed for home consumption this fast growing e-commerce brand plans to have the largest range of craft beers in the UK. Our initial focus is on the harder to brew lager and IPA category, offering lighter beers for everyday consumption. Focusing on provenance of ingredients is important to us, we have spent a huge amount of time researching the most interesting and flavoursome ingredients to add to our range. The largest range of craft beers in the UK – provided by a fast growing e-commerce brand? Curiouser and curiouser. We are working hard on the Brewhive brand and user experience. Brewhive is unique due to it’s focus on the hop. Most beers don’t make a big deal about the hop, but we plan to! To make this work, you need to cut your margin when offering a better quality delivery, hold more stock and have dedicated customer services resource. All of these cost money in terms of working capital but will improve word of mouth and customer satisfaction. A passionate brand – and a unique focus on the hop. Hmm. I was starting to get the impression of people who knew a hell of a lot about retailing food and drink, and were thinking quite deeply about how to make a success of this particular venture, but who didn’t actually have any background in beer or brewing. I sent some questions off to the intern. I’ll look forward to hearing from you. I think this could make an interesting post for my blog – combined with my thoughts on the beer, of course. Next: my thoughts on the beer, of course.